Regina Spektor performs at the Apple Store in SoHo. 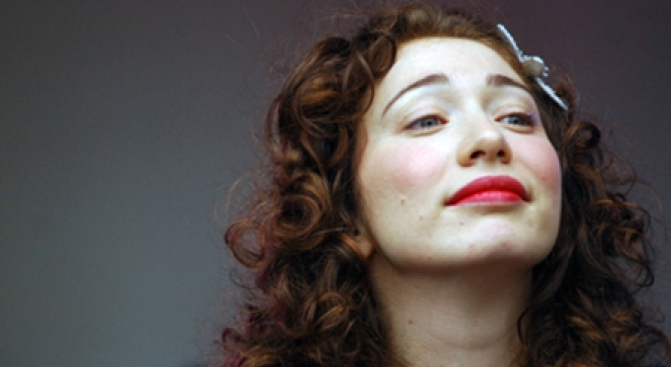 HAIL TO THE QUEEN: If you’re fresh off of hearing Regina Spektor’s lovely, lilting voice threaded throughout the '(500) Days of Summer' soundtrack and are craving more, head to the Apple Store in SoHo tonight, where the half-Russian Brooklynite will perform selectons from her new album, ‘Far.’ 7PM. FOR TWO: Tea gets a bad rap as coffee’s weak, British cousin. Tea maker Michael Harney (Harney & Sons) is part of a movement to change all that: He’ll present a tasting of 18 artisanal teas – and some delicate nibbles to go with – from all over the world at the International Culinary Center from 6-9PM. HIGH SOCIETY: If you haven’t taken what’s now become known as the High Line Renegade Cabaret – a.k.a. a fire escape upon which vocalist Elizabeth Soychak began staging impromptu shows for visitors to the High Line directly below – go, go, go. What could be more New York than someone developing a fervent fan following by singing 1930s chestnuts amid drying laundry? When the colored lanterns are lit, it’s almost showtime. 9PM.